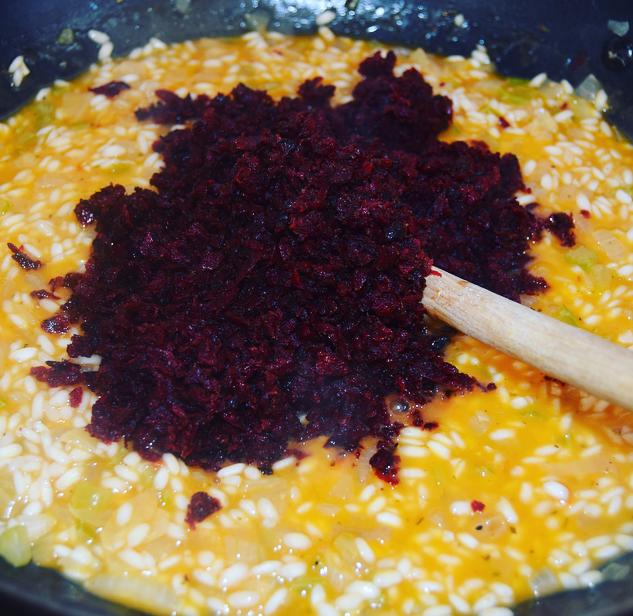 Beetroot works really well in this summer risotto; not only does it give an earthy flavour but also a beautiful red colour. I decided to use a rose wine with this rather than my usual white in risotto, just for added sweetness and colour. Risotto is such a simple dish to make but very tasty and this is a wow piece. 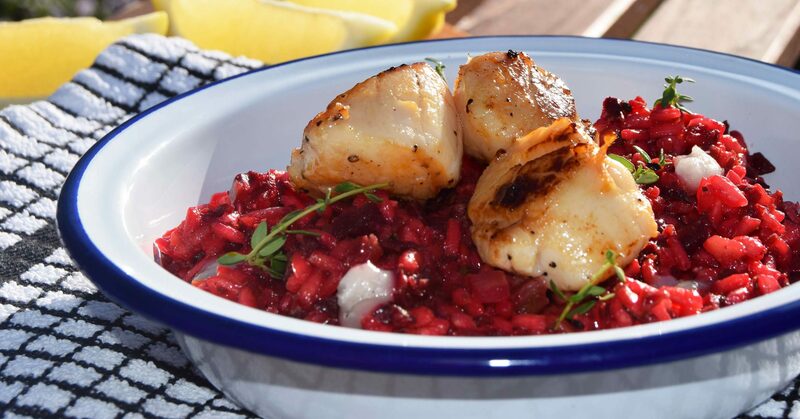 Topped with pan fried scallops and crumbled goats cheese….mouth-watering!! You can make the risotto without the scallops and instead crumble over the goat’s cheese and some crushed walnuts as an alternative! Scallops 2/3 per person remove the roe..
Heat a tablespoon of olive oil and butter in a pan then add the onion and celery, cook on a med- low heat until softened but not browned, this will take around 15 minutes. Add the garlic and cook for a further 2 minutes, then add the rice. Cook this until it is translucent, then pour in the wine. Keeping the heat moderate let the wine reduce then start to ladle in the stock, a little at a time, stirring the rice as you go. Add more stock each time it reduces. Add the pesto and stir in. You want the rice to still have a slight bite, this takes about 20 minutes. 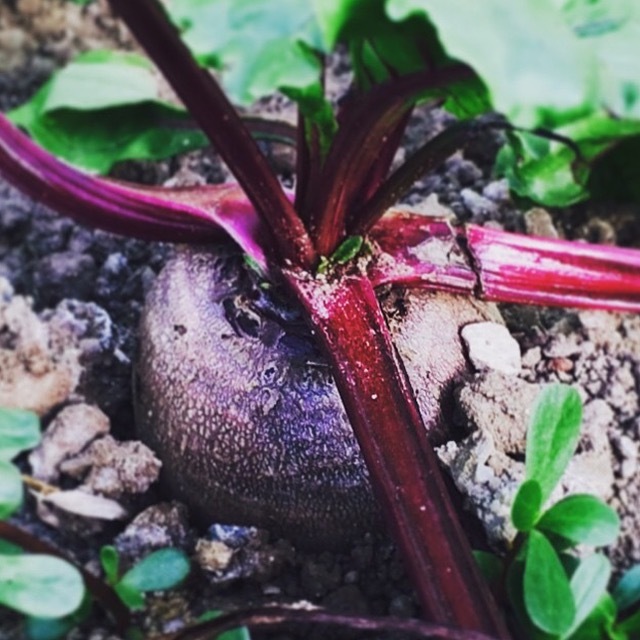 At around 5/6 minutes before the rice is ready add the beetroot, some thyme leaves and a squeeze of half a lemon. Keep stirring and adding stock. Season with salt and pepper then taste, check the rice is ready. Once cooked sprinkle over the parmesan and add around ½ Tbsp. butter. Pop the lid on and let is rest for a few minutes. In the meantime, heat a drizzle of oil in a frying pan, you can use olive oil but I used rapeseed. Season and place the scallops into the pan and cook for around 1-2 minutes each side, try not to move them around too much as you want a caramelised browned edge. 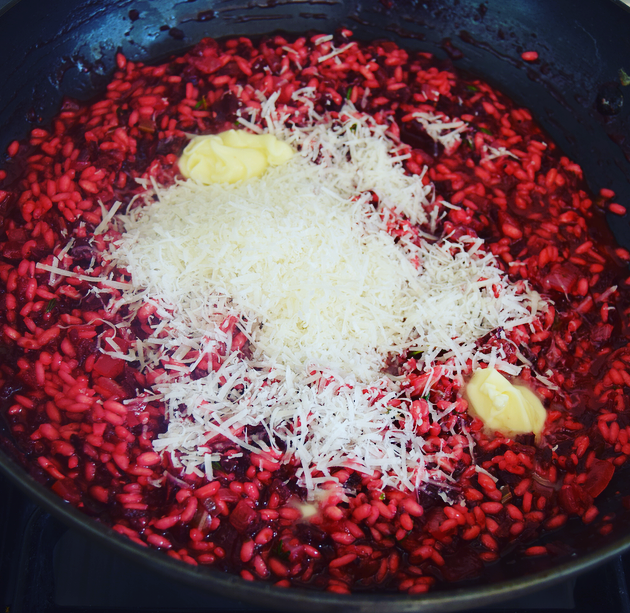 Back to the rice, open the lid and stir all of the parmesan into the risotto, now you are ready to bowl up. Place a good portion of rice into a bowl, crumble over some goat’s cheese, and sprinkle over some more thyme leaves. 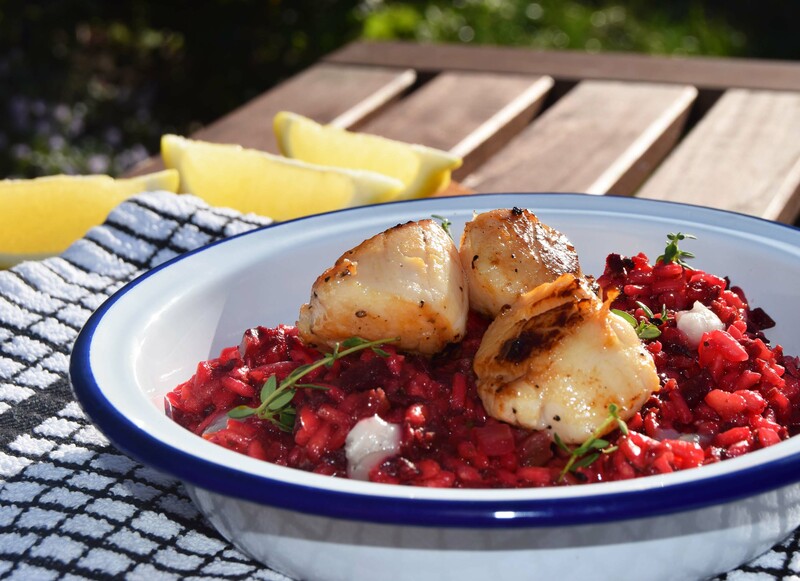 Then place the scallops over the top and drizzle over a glug of extra virgin olive oil, then go sit and eat it in the sunshine!! Add the garlic and cook for a further 2 minutes, then add the rice. Cook this until it is translucent, then pour in the wine. Keeping the heat moderate let the wine reduce then start to ladle in the stock, a little at a time, stirring the rice as you go. Add more stock each time it reduces.